Functor to print a version string. The string supplied to the constructor is printed to standard error followed by a line feed. Although the string is intended to be a version number, it can be anything you like. Sometimes people use this action to aid debugging of the parsing. Definition at line 1580 of file util/Sawyer/CommandLine.h. Definition at line 1589 of file util/Sawyer/CommandLine.h. Definition at line 1586 of file util/Sawyer/CommandLine.h. Returns a pointer to a new ShowVersion object. Uses will most likely want to use the showVersion factory instead, which requires less typing. 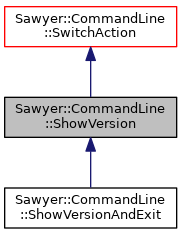 Command line action factories, and the SwitchAction class. Definition at line 1595 of file util/Sawyer/CommandLine.h.